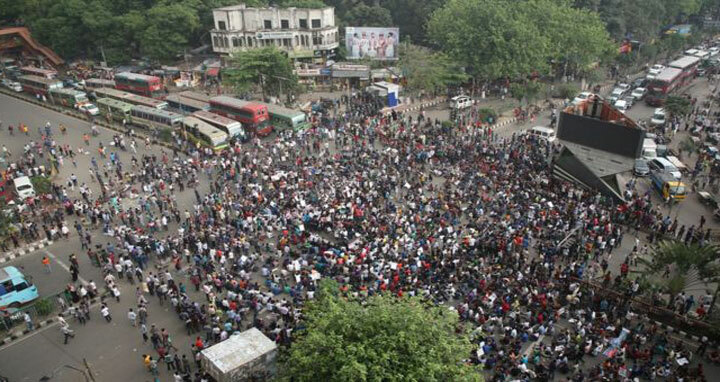 Dhaka, 11 April, Abnews: Students have announced that the protests seeking a reform of the quota system in the public jobs and exams will continue without a break everyday from 10am to 7pm till their demands are met. Boycotting classes and examinations, students are demonstrating on the Dhaka University campus and other university campuses from Wednesday morning. Students of different private university in the capital are holding a sit-in program rejecting the government’s assertion to suspend the quota reform movement. They demanded to reform quota within seven days downsizing it from a whopping 56 percent to 10 percent. The demonstrators also protested the police attack on general students, demanded an apology from Agriculture Minister Matia Chowdhury for her comments in the parliament on Monday night and questioned the role of media. Matia Chowdhury termed the protesters as “Son of Rajakar” when she was speaking in the Parliament and Finance Minister AMA Muhith ruled out any possibility of reforming the existing quota system in the government jobs before the national budget. “We will continue the movement until Prime Minister Sheikh Hasina comes up with a specific announcement to put an end to the crisis," Nurul Haque and Rashed Khan, joint conveners of Bangladesh General Students' Rights Protection Forum, said while briefing media at Dhaka University at 5:00pm. They announced that classes and examinations at all universities and colleges across the country will be postponed until the demand is met.